Over time, the exterior of your property will begin to look dingy. White materials become a bit less white, concrete begins to look aged and patios become covered in all sorts of stains. You might feel like you are stuck with these unsightly messes but you aren’t! If you are at the end of your rope with trying to keep exterior spaces clean, our Rocky Mountain House pressure washing can help! Stains can come from anywhere. Anyone who owns a property knows that stains can happen inside and outside at any level. Interior staining is out of our Gorilla’s hands but the great outdoors is our playground. 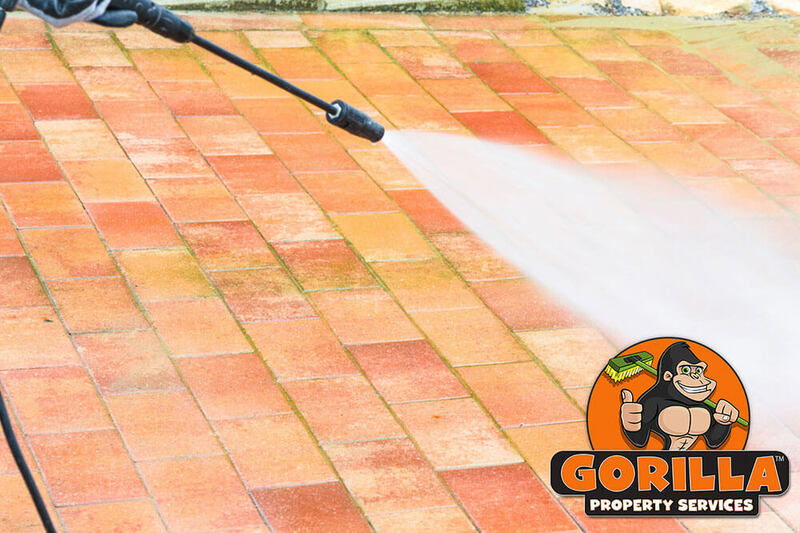 The stains, spills and discolourations that have set in around your home’s exterior can be lifted off by our Gorillas. Some of the most common staining that plagues the Rocky Mountain House area is brought on by moisture and by wildlife. Algae growth along hard constriction materials, is common in the Rocky Mountain House area. Sidewalks, driveways, foundation walls and even decorative additions are all at risk for algae or moss growth. These growths are visually unappealing but not as much as bird droppings. Bird droppings, particularly from pigeons are ugly as well as detrimental to construction materials. Instead of letting stains lead the way to surface damage or allowing stains to make a bad impression, call a Gorilla! Our Rocky Mountain House pressure washing can leave your property looking its best in no time at all. Once the affected areas around your property have been identified, our Gorillas can get to work treating your stains. A treatment of our eco-friendly cleaning solutions loosens stains at the surface level, making it possible to address the stain at its root. Once your patio, concrete, exterior walls or walkways have been treated and brushed, the Rocky Mountain House pressure washing can begin!